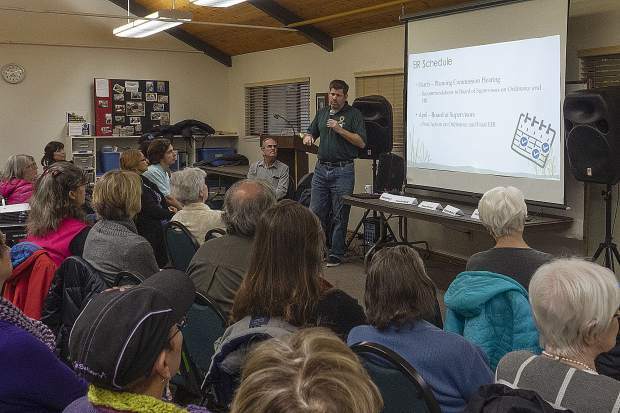 The League of Women Voters of Western Nevada County will hosted a panel presentation, "The Future of Medical Cannabis in Nevada County," on Saturday at Peace Lutheran Church in Grass Valley. Forest Hurd of Caladrius Network spoke to attendees. Attendees of the League of Women Voters event at the Peace Lutheran Church learn about various perspectives on medical marijuana. Sean Powers of Nevada County’s Community Development Agency speaking in front of the people that attended the forum. 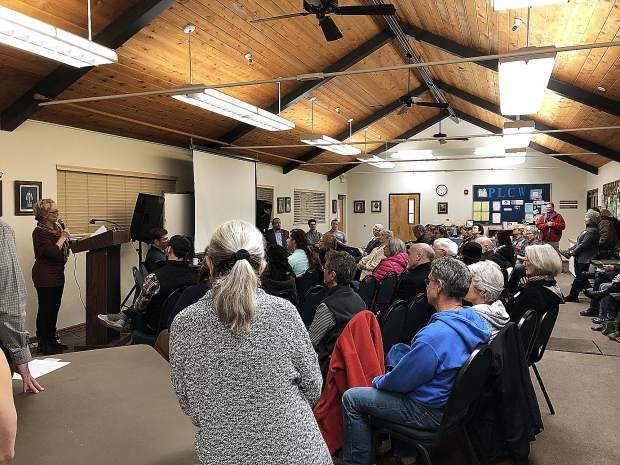 The League of Women Voters of Western Nevada County hosted a panel presentation, "The Future of Medical Cannabis in Nevada County," on Saturday at Peace Lutheran Church in Grass Valley. 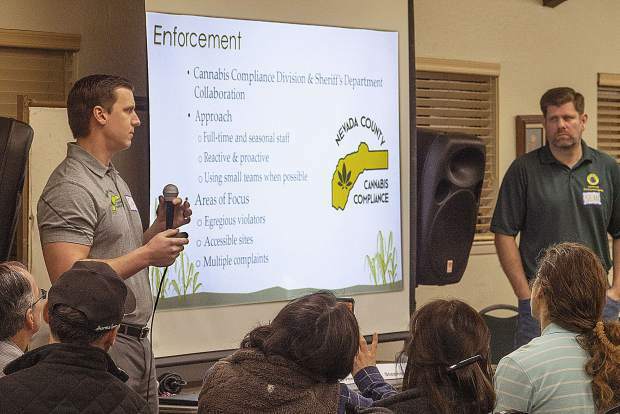 Craig Griesback Nevada County Cannabis Compliance (left) and Sean Powers of Nevada County’s Community Development Agency spoke to attendees of the forum. 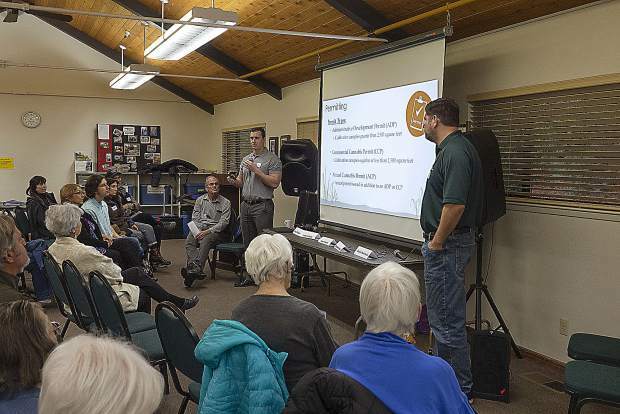 Craig Griesback of Nevada County Cannabis Compliance (left) and Sean Powers of Nevada County’s Community Development Agency spoke to attendees of Saturday's forum on medicinal cannabis use. Forrest Hurd was among a group of panelists from professionally diverse backgrounds brought together by the League of Women Voters to help educate attendees on the legal, medical and business aspects of medical marijuana. The panel included Daniel Batchelor, CEO of cannabis business Elevation 2477; Stephen A. Munkelt, a criminal justice attorney practicing in Nevada City; and Craig Griesbach and Sean Powers, representatives of Nevada County’s Community Development Agency. In 1996, California passed Proposition 215, a statewide voter initiative to legalize medical marijuana. Seven years later, the California State Legislature passed Senate Bill 420, which expanded protections for medical marijuana patients, caregivers and sellers. More recently, in 2016, California voters passed Proposition 64, which decriminalized personal possession and use of recreational marijuana for adults over the age of 21, and allowed them to “grow up to six plants,” as attorney, Munkelt said at the event. While allowing more freedoms for many, the 2016 law renders medical marijuana nonprofits non-existent because it literally makes no mention of them in Prop 64. With the passing of Proposition 64, an entirely new marijuana model was adopted, eliminating what was established with SB 420 (due to concerns with black market operations), and the right to exist for medical marijuana nonprofits, like Hurd’s Caladrius Network, which helps treat chronically ill children with medical cannabis. “What they did when they passed Prop 64 was they gave a sunset date (of Jan. 9, 2019) to take away those allowances from SB 420,” he said. It’s Hurd’s belief that the exclusion of nonprofits from the current language in the law is due to the fact that the medical marijuana industry had been exploited for recreational use so much that now people believe medical marijuana and recreational use are one and the same. “So much of the cannabis industry was pretending to be medicine that people actually started to believe that there’s no difference,” he said. There’s been significant research about the unknown, and even negative, effects of marijuana and CBD oils, Hurd said. But due to limited understanding regarding recreational use of THC and CBD, the public tends to not fully understand positive effects of medical marijuana. It’s much easier, he said, to believe the world is simple, and that things like cannabis and CBD oil are either good or bad for you. But, as the nonprofit leader has learned, it takes a complex arrangement of cannabis molecules to help people — 1,500 chronically ill children, in his nonprofit’s case — and not the most straightforward versions of CBD or cannabis. “The most purified CBD you get,” Hurd said, the least effective it is. “There are multiple (cannabis) compounds that, when combined, change how they interact with our central nervous system,” he said. “If you remove one, the other compound acts differently with it — it’s called the ‘Synergistic Approach,’” which, he said, is beginning to explain the longtime benefits of homeopathic medicine. 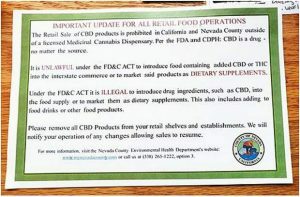 Yet, blurring medical and recreational marijuana, and issues pertaining to the cannabis underground economy, haven’t just hurt such nonprofits, they’ve also strained legal business, according to the owner of western Nevada County’s only cannabis dispensary. 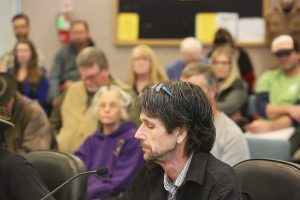 Batchelor, of Elevation 2477, said between the black market and the numerous taxes legal businesses need to pay in order to grow, sell and distribute cannabis, it’s difficult for medical marijuana shops to compete, and turn a significant profit. “We’re competing with the black market every day,” Batchelor told the crowd. Because of that, he said, the state of California has brought in “less than a third” in tax revenue than had been anticipated when marijuana became legal for recreational use. Clarification: Due to innacurate information provided to The Union, the amount of tax revenue brought in due to the sale of marijuana was incorrectly reported. The amount is less than a third.